I have an HD Flat Screen TV and when I turn it on it says NO SIGNAL. I have not seen this before as my CABLE BOX is connected and turned ON. I do not know if there may be something wrong with my Samsung TV or if it is the cable box causing my problem. I know my TV works because I can see it displaying the words “NO SIGNAL”. Is there maybe something wrong with the TV where the cables go in on the back of the TV? 1 – Is the NO SIGNAL issue happening on just one TV? -Be sure your TV is on the correct source or input as your CABLE or SAT BOX. -Press the TV button on TV remote control to turn your TV ON. -Press the INPUT button on your TV remote control. -Cycle through all the inputs on your TV. -Do this until you are on the INPUT your CABLE or SAT BOX is plugged into. -You should then see the CABLE or SAT programming show on your TV. HINT: Your TV will most likely list the TV INPUTS as: HDMI 1, HDMI 2, HDMI 3, VGA, Component 1, Component 2, and so on. -Remove or unplug the power cable from the Cable TV or SAT set top box. -Keep it unplugged for 2 to 3 minutes. -Plug the power cable back into your Cable or SAT set top box. -Give it some time for the Cable or SAT box to power up, get the signal, and initialize. -Remove the HDMI cable or other cables from your Cable TV or SAT set top box. -Keep the cable unplugged for 2 to 3 minutes. -Plug the HDMI cable or other cables back in. -Give it some time for the Cable or SAT box to get the signal and initialize. HINT: Make sure all the cables that are connected to your Cable or SAT box and your TV are tight, undamaged, and secured. -Be sure to check the ones where the CABLE or SAT come into your home. -Be sure ALL Ethernet and Coax cables are secure. -Call your CABLE or SAT provider to see if there is an outage. -Realign your Dish if you have SATELLITE. 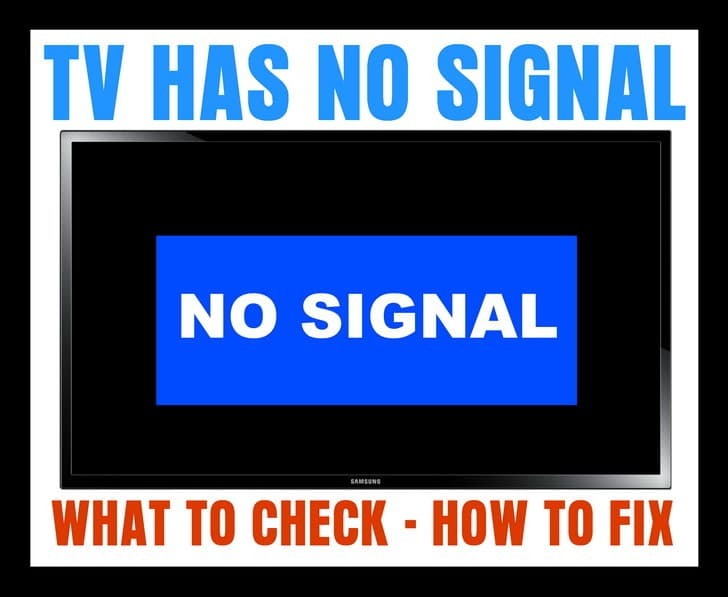 If you need more help with a TV that says NO SIGNAL, please leave a comment below and we will be happy to assist. I turn my hisense tv on and I get a blue screen with “no signal”. I press “source” on handset and usually I can scroll up and click on top item and signal is ok and freeview tv works again. This time, when I press “source” I get a list of input sources: DVB-C, ATV, AV, Scart, Component, VGA, HDM1, HDM2, HDM3, Media. Clicking on any of these does not work and I can’t get out of that list keeping appearing. My TV says no signal. I have no cable or satellite, only an antenna. I bought a new antenna and still no signal. I tried both antennas on a different TV a d they both work and the TV gets a signal. A very good signal. I have reset the TV and I have tried every input. Still… no signal. Is something inside that TV malfunctioning? All out of a sudden the tv went black and now no signal on all channels. Cant even access the retune in the main menu. Checked the other tv and the same. Checked online and it says the connection is fine down here… what ould it be? Im connected to a socket in the wall. That was checked and fine. I have been told the places the input plug into are not any good. Is there anyway to clean them. My picture is beautiful when the signal goes through. This morning there was a loud crack of thunder & a lightning strike near our home. Cable blinked & now LG TV says NO SIGNAL. Cabel company says no outages. We have unplugged, let it set, & replugged both cable box & TV. All are on a surge protector. Any thoughts?? I switched DVD players and now my Roku won’t work – it says no signal. Tried unhooking the new dvd player but it didn’t help. I was watching tv and suddenly it went off and said No Signal. My Dish receiver controls 2 TVs. One tv works but the other one says No Signal. I have unplugged the receiver and the tv that doesnt work and waited several minutes, but it still says No Signal when I turn it back on. Has that tv died? W e use an antenna for our tv, no cable. I accidentally changed the setting on my antenna mode while in MENU to the second setting and since then I get NO SIGNAL . I think I am on a cable setting, but we do not have cable. I cannot get back into the TV menu to fix. Please help. I have a Vizio TV and suddenly is showing no signal for my cable box and DVD. I followed all the steps but nothing worked. I used a 2nd cable box that it works in my 2nd TV but still not signal. I see the TV menu but when i tried the HDMI inputs none work. Also, i tried the white/red cables (Comp) to connect the DVD but no signal. If not, is it worthy to try to repair? im having the same problem and step 3 works. i just want to ask why does it happen? i didnt even touch the cable connecting from the tv to my cable box then suddenly the tv cant get a signal from the box. when i do the step 3 (or rather change the cables – the one connecting to the tv goes to the cable box then the one in the cable box goes to the tv), it works. but this happens often now. im just wondering if it’s my cord (video/audio cable) or my cable box that have a problem. I have a Vizio tv, 15 months old and having the issue with “NO Signal”. I tried all the step listed above and nothing is working. What is the next step? I’ve tried all the steps listed (& then some). The one thing I’m noticing on the tv menu is that it’s not giving me the option to stop at “analog”. It just skips past it. I have an antenna on top of my roof on a 2 story home. My other tv is working fine, but I still checked the cables in the basement, the splicer & unhooked, then rehooked up everything. This all started a few days ago & the tv kept shutting off (by itself). Today, it worked fine & then the picture froze. When I changed the channel that’s when it said “no signal”. I’ve cleaned every opening (vacuumed), I’ve unplugged, changed remote batteries, etc. I even tried the “factory reset” & now it won’t pick up any channels when scanned, but the other tv is working just fine. My Nada 19″ tv has worked well for years on regular digital channels across the United States.Tv was working well at first then all the sudden I got NO SIGNAL. I unplugged, I double checked with my roommates tv, hers works. I plugged into her antenna NO SIGNAL again. Checked DTV signal is bad. We are hooked to same antenna just two cables with a splitter. Did fine for two months. Throw away tv? Thank you…the first step it says to try, fixed the problem. My TV said No Signal component 1 . I wasn’t sure what that meant, but when it said to scroll through the options after pressing input button, I realized the hdmi cable was plugged into hdmi2. When I highlighted that option, it instantly fixed the problem. Once again, thank you. I was seriously considering getting rid of my cable….not that that would be a bad thing!! Hi, I Already follow the instructions above, but still the error was no signal, it can’t even search a channel. What should I do now?? I have a Vizio tv. The cable hdmi1 just suddenly went out. I performed all the steps above multiple times. I called my cable provider and they reset my box. I changed coax cables and got a new mini box. Still no signal.This tv is secondary and in my bedroom. The main tv and cable box in my living room is working perfectly. When i hook up my dvd player and change the input to AV i am able to watch dvds. Ive hooked up a different tv and it works perfectly. Unfortunately the tv I’m having issues with is much bigger and better quality. Any help would be greatly appreciated! I have two tv’s on a cable box and three without. The two on the box are fine, the others a=have no signal. I have tried everything and can’t get them to work. Any help please? We still get a No Signal message on our Insignia tv after we did all of the above. The other tv works fine. We swapped the HDM1 cables, & it works fine on the other tv. It appears that it is not the cable. What else can we do? I have 2 philips tv’s a couple of years old they both have been working fine and then all of a sudden they stopped recieving digital signal a “no signal” message appears when I turn tv on. I checked all the connections, tried reseting the stations, unplugged the tv and let it set then plugged it in. Everything looks good. I even unplugged the cable i use for the outdoor antenna and used an old cheapy rabbit ear type I bought at wal-mart, just to make sure it wasn’t my antennas problem on top of the house. So what I’m thinking is the broadcast antenna towers that the TV stations use to broadcast the signal might be malfunctioning. Who would i contact or what should I do? Thanks for your time. I have done everything that was required including talking to my cable provider which stayed there were no outages or problems with my wifi or internet. I am in need of help at this time. I was watching all afternoon. Turned TV off for dinner. Returned after dinner and turned on TV again. Now it is showing NO SIGNAL. SPOKE TO Fios customer service rep (hard to understand) and we went through the same steps over and over. Still no correction of the NO SIGNAL issue. Why do we pay these high costs when we cannot watch TV when we want to do so? Tech scheduled for tomorrow. One time this happened and Customer Service Rep on the phone sent a signal and “walla” I had service again. My TV Samsung was doing the same thing until I reprogrammed all the channels. Not in the setup but on the menu (plug and play). There is a video on youtube from SAMSUNG that guides you on that particular problem. My suggestion will be to try different inputs. Try connecting your cable box to another TV. Last but not least you may have a bad Main board on your TV. I have no signal on my TV. I’ve tried rebooting all the channels and everything. But this time nothing it is not working. Ive tried all the steps above and nothing has worked. The TV Is set on the right channel, I’ve reset the direct TV box , I’ve unplugged the cords from the TV and nothing has worked. When I reset the box it pops up on the TV that’s it’s restarting but once it does it goes back to saying no signal. What else can I do? I have 2 TVs a bush and a logic the bush one wont get any signal I tried all of the above and it still wont work so I plugged my logic TV in and it worked fine what do I do to fix it? My tv keep on saying no signal, even after I followed all required step trying to fix a problem but no changes. Pls help. We have just moved into a newly converted property. We have the coaxial cable plugged into the wall and into the tv as it has freeview built in. We are getting no signal and have tried two cables, we are not sure what to do! Please help. My LG tv is playing Netflix and while playing Netflix a box shows up that says no signal but I can still see the show playing and then my tv cuts off. I’m playing Netflix through the app on my tv. Why is it doing this? My “no signal” on the TV is intermittent. It goes off and on about 3X per hour. THIS AN UPDATE ON MY PROBREM WITH A Samsung TV. My problem was a bad TCON board. As soon it was replaced everything was ok.
No more “weak or no signal” on the screen. No more broken dots in the picture. A $ 25.00 item fixed my TV problem and saved me a lots of money. Thank you so much for this update. Closest I’ve seen to any reply on the ‘no signal’ TV issue. We had pixels that were not working properly already, so I’m going to try the TCon board, almost certain, you answered and solved our issue. Thank you. 2 days ago both of our tv’s started showing the no signal message. We set both tv’s up December 2016 and have had no problems until now. We only have antanna tv, no cable. It was hooked up from antanna to a booster that has a splitter to the 2 tvs. So I bought a new splitter and bypassed the booster, still the same. Nothing has changed in my house so I can’t figure out what to do. Suggestions???? LG smart tv…. bought new 2016 not sure of model number and don’t want to take off the wall to find it. my Startimes decoder together with the TV screen have been working nicely since but unfortunately on Wednesday, 21st June, it stopped only the TV screen showing ” No signal” help me plz. I have a non HDMI tv. Am trying to connect my Roku via HDMI to RCA converter. Am getting no signal on tv. Plz help. I was watching tv and all of a sudden my tv went out no signal no analog or digital channel. I checked cords and I don’t have cable I just have an antenna and it’s on the right port. Help what do I do. I have an LG 47 inch TV. When i turn it on there is no signal for about 10 minutes and then it starts to get it. Why does it takes so long? I tried all the steps and nothing. I have another TV same cable and same electrical socket and no problem at all. There is something wrong to my tv SKYWORTH in Samsung cable signal. It is on the correct source and i keep on putting it some cables. All of them are not working, that TV is my favorite because it is small and all the channels are HD. We don’t have cable so what do we do? My LG LED TV has HDMI working pretty fine. The av says no signal. The service centre guy says main board needs replacement , however I am not convinced cause my entire TV works fine otherwise. My Samsung TV is showing no signal. I have bought a new hdmi cable but still the same problem. I have also tried a scart lead. We’ve tried all steps. We have an Android box and a Westinghouse TV. It was working fine last night. My Sharp LED TV shows no signal even when I have a signal from the cable box. I’ve tried the unplug everything and plugging it back but it still shows up. I have a Spectrum HD TV. I recently cancelled my Direct so I have been trying to use my Roku. The TV continues to show no signal floating around on the screen. Please help. I have a Veon 32 inch LCD TV. I moved to a new house and I still have a no signal on the screen. It’s like I’ve lost all my channels. I have retuned it multiple times. I’ve switched sources and everything and it still doesn’t work. Turn off TV, unhook cable from outlet, wait 60 seconds, plug it back in. Remove all TV remote batteries then start clicking all buttons including the back of VIZIO remote, click all buttons, even better to click all twice, do the same on Cable remote, click all buttons once or twice, put batteries back, turn TV & cable on and everything would be back to mormal, as if nothing happened. My LG TV in the bedroom goes off with a “No Signal” message at exactly 01:08 every morning. It is not a signal loss as other TV’s still work at this time. There is an RF loop through from a BT Vision box which if bridged out makes the TV show a picture very briefly then goes back to No Signal or shows a very poor picture for a moment then goes to No Signal. There are no regular ‘off times’ set in the menus and nothing to suggest why this is happening. I’m assuming it’s some kind of software/programming issue but updates have not solved it. If we switch the Youview on, the TV works perfectly via the HDMI input. It still comes up no signal. I even hooked another TV up and it works. Change INPUT quickly within 3 Sec. Tried everything. My panasonic tv still says no signal. Just moved to a new flat so maybe the aerial has a problem.What do you think? I’ve done steps 1-4 and still I have a no signal! What should I do ? Could it be my tv? It was working fine earlier! I’ve called the cable company and walked through everything with them and still nothing! Yesterday my Vizio 55″ LCD suddenly displayed “no signal” figured it was the cable box (U-verse), but none of my inputs are getting any signal either (boy ray, Apple TV, fire stick). Definitely seems like a tv issue but I don’t know what to try? I still have no signal on TV screen after I have followed the above mentioned step. So now what I have to do in order to get signal? Do I need to tilted the dish or else what I have to do? Yes try moving the DISH and make sure it is pointing in the correct direction. Be sure no trees or other objects are blocking the DISH. The DISH needs a “CLEAR” view of the sky. The power went out here for about 3 seconds, but when the cable came back on it showed NO SIGNAL on the TV. I tried the steps above to remedy the situation, but to no avail. What is the model number of the TV you have? Also, what cable company do you have and what is the cable box model number? After setting up PEEL REMOTE on my Vizio Smart TV, it started saying no signal. TV turns on but no signal, can’t use my TV remote either after foolishly setting up from my Android smart phone the Peel remote on my Vizio TV. I followed all the suggested troubleshooting guide but to no avail. My dogs knocked my box off the tv while i was gone today. Everything is plugged in still. But the card was ajar. It comes on but white channel with lines. Are you talking about a SAT box that is damaged? Vision tv. Mediacom cable. HDMI-2 works fine on the main tv and also in the bedroom. However HDMI-1 says no signal. Tried everything that I’ve read. ie. connections. Resetting tv. Etc. Even dealt with mediacom agent. Nothing. Help! I have LG LED SMART DIGITAL TV About every month I lose all signal on 7.9.10.sbs network except on ABC network. I am having issues with my tv monitor. I have 2 computer monitors and 1 tv all hooked up to eachother. Everything was working fine until i plugged in a new controller. Now the tv says no signal. I tried unplugging it and plugging it back in but that does not seem to help. Any suggestions? I have just moved into a house and I have tried setting up my tv and hd set top box, and I keep getting no signal, I have brought a indoor antenna and I still can’t get it 2 work, I have got the hdmi cable connected into the right spots, I have put the antenna part into the wall socket and into the tv but still getting no signal. Someone suggested a booster cable but I’ve never heard of it and don’t know where I would get 1 from. My TV is hooked up to cable and works fine but, when I switch it to air channels, it takes 40 minutes to come on. It says no signal, but after 40 minutes it comes on. When I turn it on and hit source HDMI, it comes on right away, but when I hit source and it’s air channels, it takes 40 minutes to come on. It gets no signal for 40 minutes. Is my TV going out? I have a Polaroid TV, just had cable hooked up! “NO SIGNAL” had tech come back out to check cable (dish) installed correctly, still “NO SIGNAL”. I do not have the TV remote so I am in a quandary! What do I do? My PlayStation 3 comes on but to put it back on the For Television to play, it has No Signal, I pressed the SOURCE to get an internet connection and it would not change. What Do I Do? Do I unplug everything and then plug everything back. My LG tv still says no signal no matter what I do. I was having trouble with the hard drive freezing and turning tv off after making a ticking sound every 3 seconds and wont let me change the channel. If I play recorded tv I have no sound. I also have no signal on any other components. We have a fairly old (2008) Daewoo LCD flatscreen tv – which has worked pretty well, until this morning. Problem: It will not stay on the HDMI channel. When HDMI is selected the tv seems to switch off and then come on again to the ”no signal” message. We use a Virgin Media Tivo box which is the ONLY source for the TV – via the HDMI input port. Normally . . . When the tv is first switched on, we get the ”no signal” message, and have to scroll through the multimedia channels with the tv remote until HDMI is reached, and then and only then can the signal from the Tivo can be watched. We also have a dvd player plugged into the tv via scart lead on channel AV1. AV1 and AV2 channels will also cause the tv to switch off (red light on… flashes… then green) and be back at the ”no signal” message. Sounds like the TV may have an issue with a loose/faulty HDMI cable, the HDMI connections in the TV are shot or a circuit board issue. You may just simply have a loose wire or a faulty HDMI cable. Check to be sure the cables are secure, not damaged, and none of the connections are bent (on cables and TV). Have you tried switching cables and components? Are the cables connected correctly? Unfortunately, our old Daewoo died a death by the following morning. Nothing would work when she was turned on. No lights on the front nothing – so – she has gone to the big tv graveyard ”in the sky”. Since replaced by a Samsung series 6 tv. Try a new HDMI cable. Be sure the component the HDMI cable is connected to is ON. I accidentally pressed down on my hard disc remote which I use to access my freeveiw channels. Since then (last night ) I can’t get my TV channels on the screen keeps saying to check my antenna. and I can’t get my channels working. I don’t know what I’d pressed on to lose the TV channels can you help ? OMG! It worked without calling the cable company!! THANK YOU!! I had Mitashi led TV. I had lost my led remote. And on my led getting msg No signal. I had check my set up box. It get red and yellow light but no Channel will start. I have a Sharp LED TV. I have no signal and I have tried everything you suggested. Except getting a new HDMI cord. When I first turn the tv on with the remote it says, analog 7.0 what does that mean? And also I have the no signal box on my screen. My tv was working fine and in the middle of a program I lost my connection. I don’t have cable tv. I have an antenna. Can you help? Have you tried checking that the TV antenna wires are secure, tight, not damaged, and the antenna is in the correct place? Do you have the TV in the correct INPUT? The TV needs to be set on ANTENNA when you cycle through the INPUTS. Try everything above and then run a CHANNEL SCAN for the ANTENNA not cable. What type of TV ANTENNA do you have? The newer flat small HDTV antenna or the older large roof antenna? Let us know if you get the Sharp LED TV working. Thank you – My TV, just by unplugging and replugging the cables on the Internet box, it fixed the problem. Used my TV last night and it was in perfect condition. This morning, the audio on cable’s working but no video… It’s saying No signal. However, the Dvd input (AV1) is working and in perfect condition. I’ve tried everything including all the steps listed but the cable input won’t work. Please, what do i do? You may have a bad coax cable wire causing the issue. If not then possibly your cable company was simply having issues at that time. Have you checked it recently. Does the issue still exist? Try replacing the cable from the cable box to the TV. Try resetting the cable box. Try resetting the TV to factory default setting. I have both a Vizio and a Samsung smart tv that do not recognize the Roku Streaming Stick. I get ” no signal”. I have tried the troubleshooting steps listed above. Help please. I have a TCL tv. It turns on. Image and audio ok but in less than 5 mins the no signal message appears. Prob for couple of weeks now. Cable box was changed. A friend checked it out this morning. Started working fine. Turned it on again now and same problem. I have a Vizio, approx 8 years old. 6 days ago lighting struck and ever since this TV shows “no signal”. I have tried everything and even tech support and new satellite box. Computer will not connect either thru HDMI. Does this most likely mean the TV is shot? My TV still has picture and volume, but still have the “no signal message” box in the middle of my TV. I have tried to do all the suggestions above but it won’t go away. What component are you trying to connect and watch on the TV? Have you made sure the cable or cables are not damaged? Try using new cables to connect the component to your TV. I have an LG TV. Shows no signal message. Tried everything suggested by you. How do I get the picture back? The No Signal message means that the TV isn’t getting any input from the currently selected source. 2. If your Remote has an Input/Source button, press it and choose the input from the list that matches where your device is connected.